Oo.. sneak peak of upcoming Pages feature, Smart Annotation. When you annotate, it anchors to the word or image. So as you type, the annotation moves. This is much cooler than annotating on a PDF. 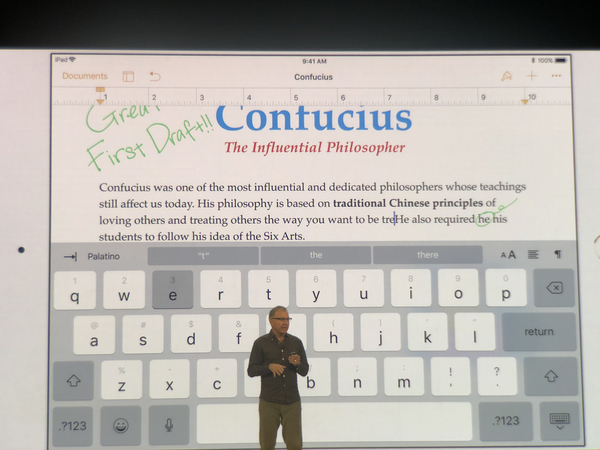 Digital books creating is coming to the iPad. They will be building it right into Pages, and on the Mac too. Maybe iBooks Author is gone? Neat feature, you can use Apple Pencil to add your own illustrations to your books. Supports collaboration to create a book as a group. Moving on to Augmented Reality! Since the new iPad uses the A10 fusion, easily supports AR. There are a few examples of some new AR apps for students. Like one that allows students to view their artwork on an easel in the classroom, and get up close. Anotehr by the World Wildlife Foundation to show environmental impacts. 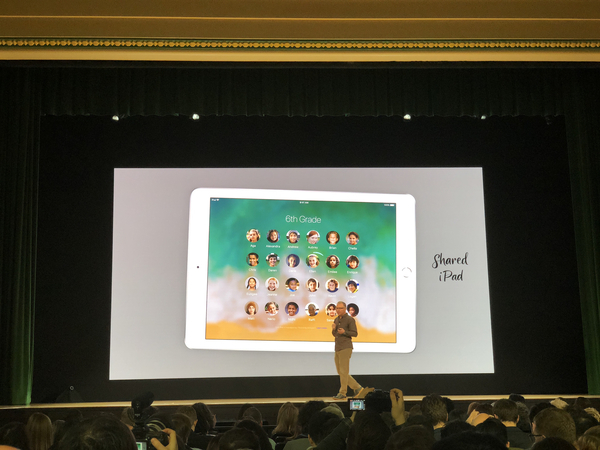 New iPad will have the same price points as before. $329 for consumers, $299 for education. 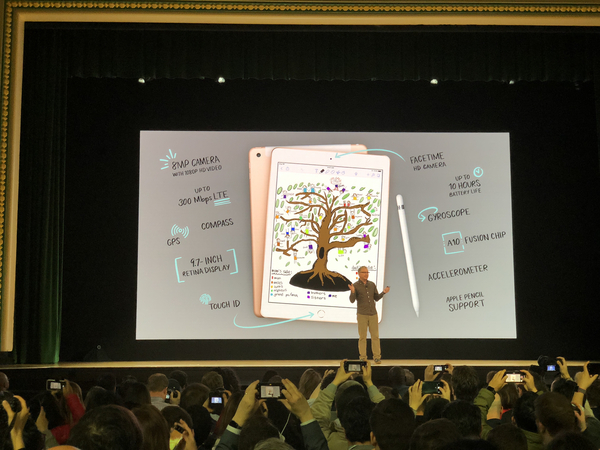 New iPad available to order today, stores later this week. 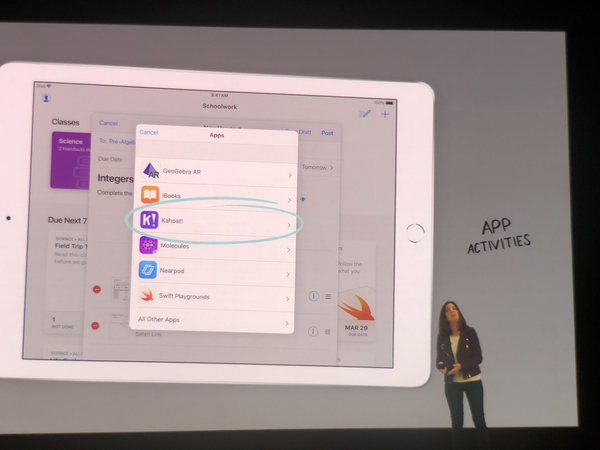 iWork update also live today. GarageBand and clips are also being updated. Now, classrooms can share iPads. Really easy to move between students. Can easily create Apple IDs for students. Bummer that is just for schools..! 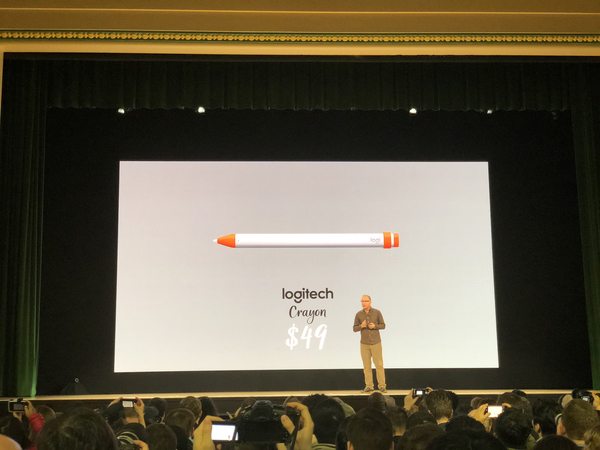 Greg is highlighting some new accessories coming, like a rugged case and crayon from Logitech. That's a wrap on iPad! Moving on to new things for teachers. Can see what kids are working on, and can provide additional guidance. Classrooms is now coming to the Mac! Free on the App Store. Teachers can see all their classes, as well as upcoming assignments. This looks pretty cool. Teachers can send handouts, reminders, homework, etc all from Schoolwork. Schoolwork makes it easy to integrate with apps. Can do more than just point them there, they can actually assign an activity within an app. Of course, huge emphasis on privacy here. Only teachers can see students information and progress. 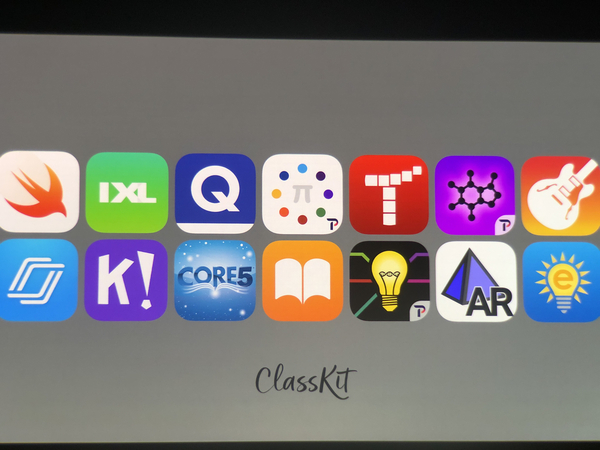 Privacy is "something we are very passionate about"
Introducing ClassKit API, highlights a handful of apps already adding support. Schoolwork will be available in June! 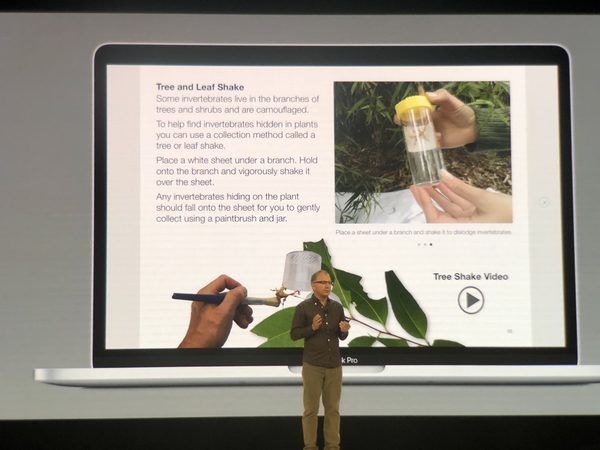 Apple Teacher is a new tool available to teachers, which helps with training and inspiration. Almost 1 million badges have been earned by teachers. 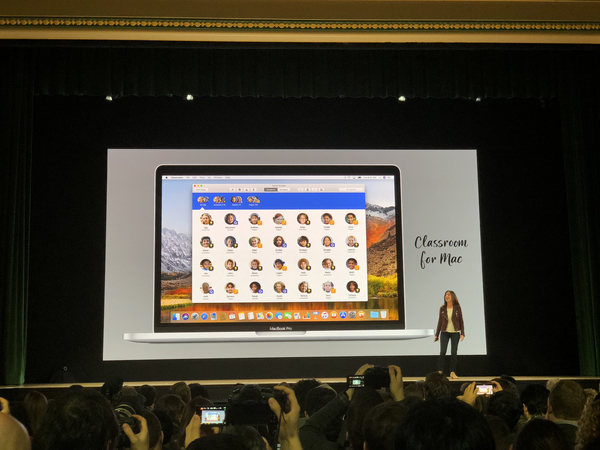 Nikole Blanchard from the Dunham School in Baton Rouge is on stage to talk about using Apple Teacher in her schools. Back to talking about Everyone Can Code. Espousing benefits not just for those who want to be a developer, but for self esteem, problem solving, and more.